Nehemia’s Mitzvah Technique is a gentle discipline developed by M. Cohen-Nehemia. It deals with the structural alignment of the body and its postural and spinal balances and motion. 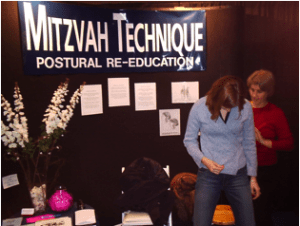 The Mitzvah Technique is a postural reeducational method that is based on the activation of our inherent Mitzvah Mechanism. It involves practical chair, stool, barre and wall exercises. The gentle and powerful Mitzvah Technique tablework is designed to undo tension to encourage the activation of the Mitzvah Mechanism during the exercises and interconnected discipline. The activation of the Mitzvah Mechanism is what brings the changes and improvements to postural body usage. All of Nehemia’s Mitzvah Technique Exercises use a relaxed turn out of the feet and legs to promote hip mobility. Pausing, minimal repetitions and mindful not overdoing all encourage the activation of the Mitzvah Mechanism. The Society of Mitzvah Technique Teachers of Canada represents and supports the Mitzvah Technique as developed by M. Cohen-Nehemia. Initiated by M. Cohen-Nehemia, the SMTTC was established in 1993. The SMTTC requires confidentiality, honesty and professionalism from its members.